De Havilland DH.110 Sea Vixen FAW.2 XP928 first took to the air in1963 and went into service with 899 Squadron, flying from the Royal Navy's HMS Eagle, She is the biggest, fastest and heaviest privately owned twin engined fighter in Europe. Additional information about the Red Bull Sea Vixen Graphic: The Sea Vixen was the last type of fighter plane produced by the original De Havilland company, G-CVIX formerly XP928 is the only one flying in the world today. 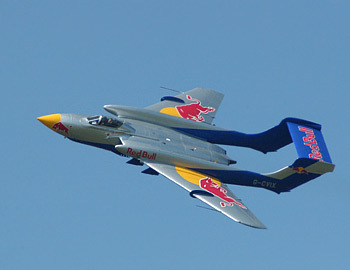 Siteseen Ltd. are the sole copyright holders of this Red Bull Sea Vixen picture, unless otherwise stated. We only authorise non-commercial picture use and particularly encourage their use for educational purposes. This Red Bull Sea Vixen picture is not in the Public Domain. 3) Use of this Red Bull Sea Vixen picture, or any of our pictures on websites re-distributing copyright free material is strictly prohibited.